Organize your recipes. Create grocery lists. Plan your meals. Download recipes from your favorite websites. Seamlessly sync to all your devices. Features • Recipes - Download recipes from your favorite websites, or add your own. 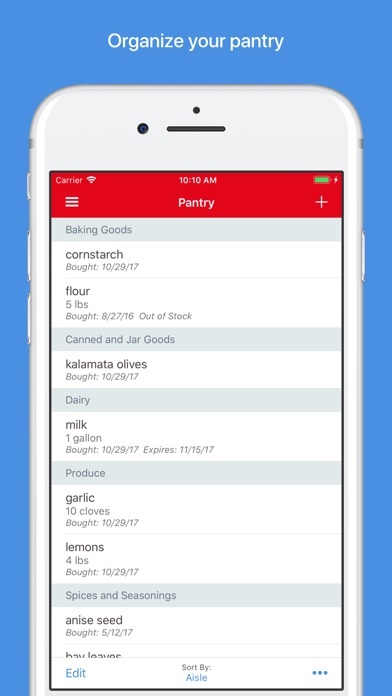 • Grocery Lists - Create smart grocery lists that automatically combine ingredients and sort them by aisle. • Pantry - Use the pantry to keep track of which ingredients you have and when they expire. • Meal Planner - Plan your meals using our daily, weekly, or monthly calendars. • Menus - Save your favorite meal plans as reusable menus. 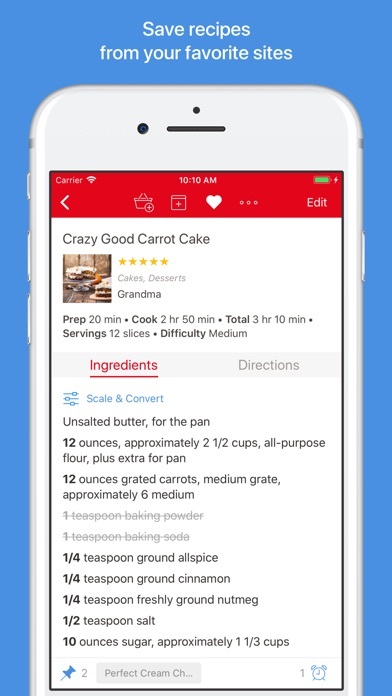 • Sync - Keep your recipes, grocery lists, and meal plans synced between all your devices. • Adjust - Scale ingredients to your desired serving size, and convert between measurements. • Cook - Keep the screen on while cooking, cross off ingredients, and highlight your current step. 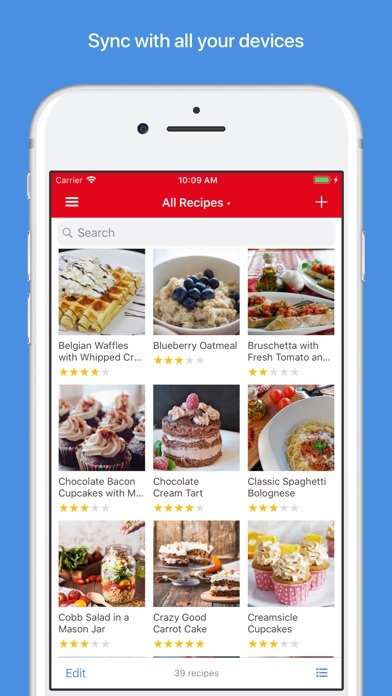 • Search - Organize your recipes into categories and subcategories. Search by name, ingredient, and more. • Timers - Cook times are automatically detected in your directions. Simply tap on one to start a timer. • Import - Import from existing apps such as MacGourmet, YummySoup!, MasterCook & Living Cookbook. • Export - Export your meal plans to Calendar and your grocery lists to Reminders. • Share - Share recipes via AirDrop or email. • Print - Print recipes, grocery lists, menus, and meal plans. Recipes support multiple print formats including index cards. • Extensions - Save recipes directly in Safari and view today's scheduled meals. • Bookmarklet - Download recipes from any browser straight into your Paprika Cloud Sync account. • Offline Access - All of your data is stored locally. No internet connection is required to view your recipes. What's New in 3.0 • iPhone X and iOS 11 support. • iOS app is now universal. • Multitasking support on iPad. • Add multiple, full-sized photos to each recipe. Embed photos in your directions. • Insert links to other recipes or websites in your ingredients or directions. • Format recipes using bold and italics. • Convert ingredient measurements between standard and metric. • Search for recipes across multiple categories. • Add custom aisles to your grocery list and re-arrange them in your preferred order. 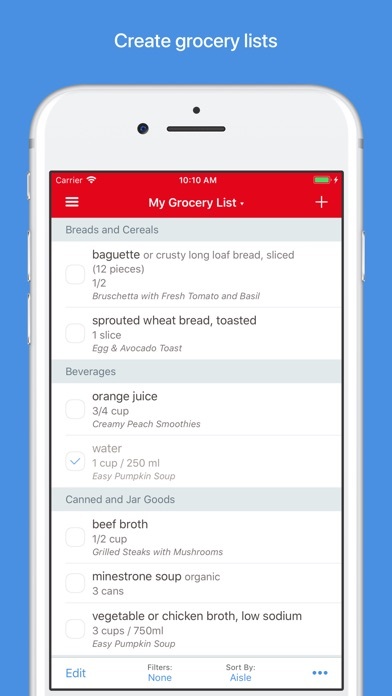 • Create multiple grocery lists. • Add custom ingredients to the pantry. Track quantities, purchase dates, and expiration dates. • Move items back and forth between the pantry and grocery list. 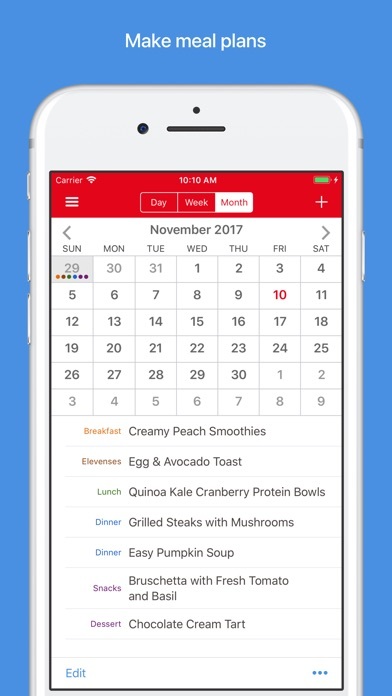 • Add custom meal types to the meal planner. • Create reusable menus that span multiple days. I have always thoroughly enjoyed paprika and have shared that with many people. Since I downloaded the newest version I have had nothing but problems. When I access it often times there are only three recipes there and it will not sync with my iPhone. The only way I can get it to work is to totally delete the app and reinstall it. This is very frustrating and I hope this gets dealt with soon I never had any problems with the old app and I’m not doing anything differently. Paprika has been the only recipe manager that I have ever needed. I love the cloud sync between iOS devices & my Macs. I would like to see them add a “Last Viewed” screen to the Category list. Sometimes I need to access multiple recipes simultaneously & it’s a pain to navigate to each recipe over & over again. A “Last Viewed” screen with a list of the last 4 or 5 recipes that you looked at would enhance this already wonderful app. Thanks! Have been using Paprika 2 since 2015. Hands down this is the best recipe saver/organizer I’ve ever used. The upgrade easily integrated all of my files and recipes from the older version into Paprika 3. Very excited the app syncs my iPad into my phone, grocery lists and recipes are always available, especially on those rushed days when stopping by the grocery store before heading home. The new app is well worth the upgrade fee. Thank you to the developers at Hindsight Labs. I buy a lot of apps. A lot of apps. I am either satisfied or disappointed in almost all of them. This is the best written and most complete app of all by far. I would pay ten times the price even for an upgrade. Recipe management sounds like just an easy database app but this is so very comprehensive. My favorite feature is to find a recipe online, copy the URL, open Paprika and it asks if I want to create a perfectly formatted recipe card. Every field is filled in automatically including a photo, nutrition information, number of servings and source. Amazing. You can edit it with any changes you want to make, put it into a catagory such as Dinner or Instant Pot, and finally give it a rating so you know whether to use it again. All of my recipes are synced on my iPad, Mac, and iPhone. When I shop I pull the app up on my phone. When I cook I just prop up the iPad on the counter. I can't think of one thing to make this better. Again, not just the best recipe app, it is the best app altogether. I have used other recipe apps that have been helpful, but Paprika blows them out of the water. Very well laid out and intuitive. Definitely recommend. This app is wonderful! It has many great features and the cross platform sync support is a lifesaver. Really my only complaint is that the grocery list doesn’t delete purchased items. When you check an item off it simply greys out, then your list just keeps growing and becomes unusable. You can manually delete each one (huge pain) or clear the whole list (but then you have to add the unpurchased things back on). I can’t understand the logic behind this decision, hopefully they will update it soon. I’ve been looking for a recipe organizer app for a while and only recently found Paprika. It does what I want, cleanly and efficiently. Thank you, this was exactly what I was looking for. Love the feature of importing recipes from websites etc. This is a great recipe management app, and it's really making the switch away from a paid menu planning service easy. But it's badly in need of an Apple Watch app for grocery lists, and allow the import of list items from Reminders. I have both this and the desktop app. This solves my recipe management problem most suitably. I love Paprika. I’ve been using it for years! I’ve recommended it to several people, and they love it, too. I only wish recipes from the weightwatchers website would load more cleanly and that there were a coordinating Apple Watch app, such as timers for different dishes, grocery lists, etc. Oh, also the search query seems to require a specific order to bring up a recipe. I’d like to be able to search “chicken” and find allllll the recipes i have saved that include the word “chicken” in its title. Otherwise, very happy!!!! I even use the grocery lists as my daily to do lists, in addition to keeping a running list for various stores.